Using our varying methods and with our wealth of experience at SW Directional Drilling we can install drainage pipe work of all sizes for all types of waste, be it Conventional, Chemical or even Hazardous. With our great expertise in this sector (over 300 installations) and through working on numerous major contracts over the years, we know exactly how to install drainage to falls as tight as 1:200 and to match the clients needs. The trenchless method of install drainage is fast becoming the only method that a lot of major companies will consider. 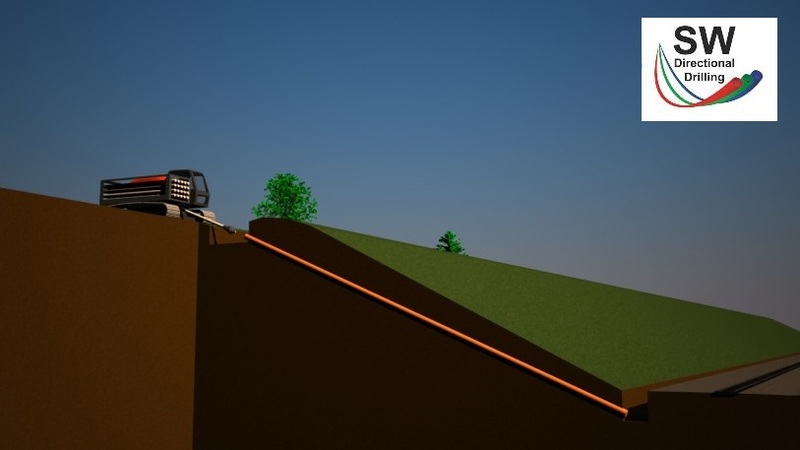 Negating the need for major excavations, especially with the deep installations and reduction intime taken the benefits of trenchless methods benefits are massive. With the vast majority of the UK's trenchless drainage installed being in the 100mm to 300mm range, it's no major surprise that we have expertise and unrivalled experience in this field. Although sizes are often on the smaller ends of the scale we have installed drainage up to 600mm in the toughest of ground conditions. One of our most recent projects was to install 330m of 355mm and 250mm drainage for Cowlin through the Bath University complex. The majority of this installation was at 4-5m depth at a fall of 1:200, in solid Limestone! The full installation was complete over 4 shots and within 1 month. This would have took at least 6 months to be installed with other methods, and might have even been impossible. The approximate costing's for the Directional Drilling were 1/10th of the open cut costs. 330m of 355mm and 250mm of Deep Drainage through solid rock for the new East Building at The University Of Bath. Works completed and commissioned inside 1 Month. 80m of 450mm Surface Water Drainage across a Railway line, embankment, wooded are and the busy A38 in Bodmin, through solid slate. Drainage had be installed on a gradual curve to meet the spec, works were complete inside 1 week. 70m of 355mm Surface Water Drainage for a new school in Stockton-On-Tees at a fall of 1:150 installed at 3m depth. Work was complete inside 1 day. 40m of 180mm Surface Water Rail Crossing Drainage for Birse Rail at Southend Airports new Rail Station. This installation was installed at 4m below a live Rail by our PTS trained staff at a fall of 1:100, work was complete inside 1 night-shift. 60m of 225mm Outfall Drainage for Carillion at Jarrow School. This installation was installed at a fall of 1:50 for the first 20m to cross above a live existing sewer and below a medium pressure gas main, the drill was then steered to 1:5 to fallow the angle of a steep bank and to meet the outfall of a small stream below. This installation was complete inside 1 day. 230m of 225mm Surface Water Drainage for Border Construction at Trinity School in Carlisle. This was installed at an average depth of 3m across contaminated land, preventing major excavation and ground disposal costs. This installation was complete inside 4 days. 60m of 160mm Rail Crossing Drainage for Hovington to provide relief for a new housing development. This installation crossed the tracks at 4m depth and met an existing foul drainage manhole at 5m depth. This installation would have been impossible by any other method and was complete inside 6 hours! 200m of 315mm Surface Water Drainage for Story Construction at Ghyll Bank in Carlisle. This installation was carried out through really tough ground, as wasn't predicted from the Geotechnical survey, at a fall of 1:200. This installation was carried out within 1 week. 42m of 355mm and 24m of 160mm Surface Water and Foul drainage installed for Absolute Civil Engineering, on Behalf of Barratt Homes at Chase Farm Drive, Blyth. Installations were installed through Sandstone and boulders (not the clay that was expected). These were tough installations due to massively varying ground but works were still complete within 1 week. 70m of 315mm Flood Alleviation drainage at Tan-y-Foel Quarry, Cefn Coch, Wales for HV Bowen. The Installation was carried out through solid Gritstone inside 2 days. 2 x 40m of 90mm Rising main installations at Carlisle East Fire Station for Border Construction. Works were carried out inside 1 day. 2km of 125mm Rising main installations down carriageway for Active Tunneling. Pipeline works were complete inside 12 Days.